2.Cactus Blossom Exfoliating Gel Body Scrub is 100% vegetarian, 250ml. This scrub formula is insanely delicate and just like the shower gel, its enriched with cactus flower extract from Morocco and Community Trade honey from Ethiopia. In the gelly texture are trapped some insanely cute raspberry seeds and I have the feeling this will be the next popular shoot for the #tuestdaytexture on Instagram. 3.Cactus Blossom Body Yogurt is 100%vegan, 200ml. 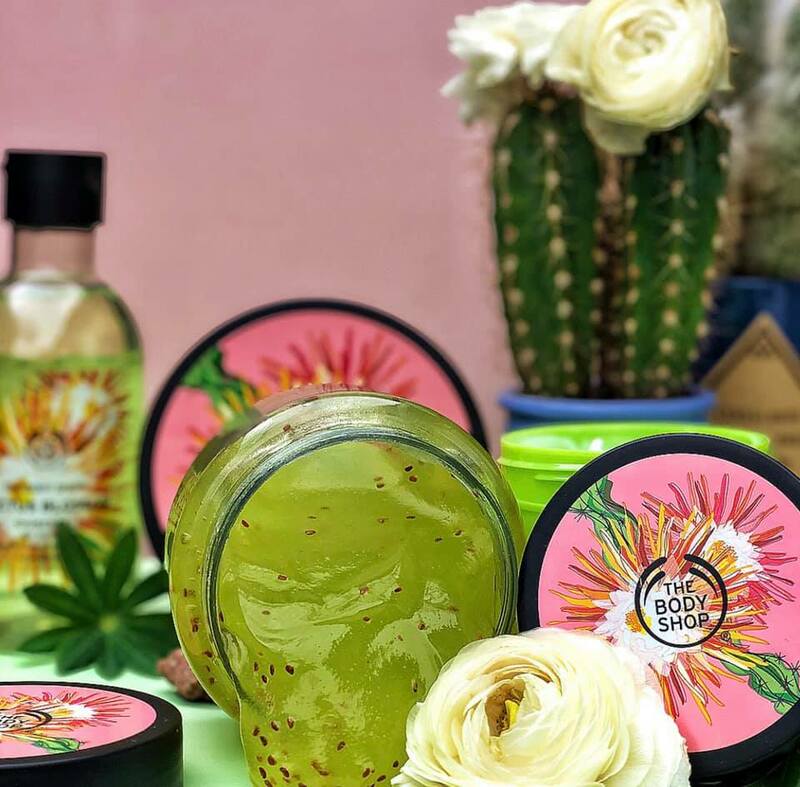 Just like the other body yogurts from The Body Shop, Cactus Blossom is instantly absorbing and has that amazing non sticky light gel -cream formula that can be applied on damp skin after you are done with your shower. The Body Shop yogurts are one of my favorite body moisturizers and if you haven't tried them yet you are missing so much goodness! Suitable for all skin types. This product is enriched with, of course, the pretty cactus flower extract from Morocco and Community Trade almond milk. 4.Cactus Blossom Softening Body Butter, 100% vegan, 200 ml delivers 72H intense moisture for dry skin. This product is enriched with Community Trade shea butter and cocoa butter from Ghana, cactus flower extract from Morocco and a drop of sunflower oil. It has a beautiful, rich and creamy non-oily texture, but light as air. As a skin care addict and a cactus lover I find this Cactus Blossom line from The Body Shop absolutely adorable and I wish it was something permanent. Honestly these products are perfect to use on a day when you been siting in the sun at the beach and you want to feel fresh and clean, treat your skin, keep it soft and restore the moisture you lost while tanning. What are your thought about The Body Shop products and their limited editions ? I've never heard of this brand but it sounds amazing. The exfoliating body scrub sounds like something I need to try....I'm always in the sun and my skin tends to get a little dried out! The Body Shop is a huge, prestigious and international brand, I am surprised you haven't heard of it by now, but that's ok! They have amazing natural products and all of them are cruelty free because they ever test on animals.You should try the body butter if your skin is dry from the sun,that would help a lot together with the body scrub! Man, technology unleashes nature's potential really. We were just joking years ago that you can brush your teeth with charcoal.. and now this. Hope they distribute too in asia so we know how effective it really is. Michael,I love what you said about the nature and technology. I agree with you! I honestly don't know if they still sell anywhere in Asia since they don't belong to the L'Oreal trust anymore.The Body Shop is completely against testing on animals and it would be great if everyone could enjoy these amazing products from them. I am so pleased and happy to hear you love using natural products. All their products are really lovely, specially the body yogurts! 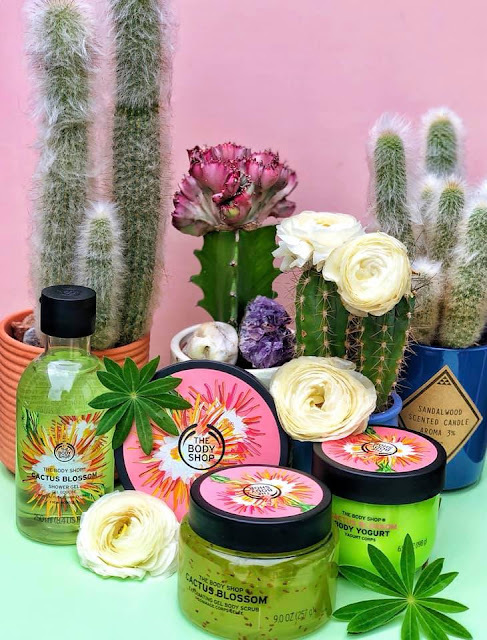 I love The Body Shop brand of bath and skincare, although I have not heard of the Cactus Blossom line before. Sounds amazing! The Cactus Blossom is very new and is limited edition.It's for the first time they made any products with cactus blossom. These body sop products sound lovely. I didn't even know they had a cactus blossom range out. I must look out for those next time I go. It's very new this line,just hit the store about a week ago. Last year they had an amazing limited edition with bananas and that was very lovely too.I hope you get to try it soon ! I have had the opportunity to use some of The Body shop products and they are very good. I need to try out the scrub. I agree with you,they have such great products! It is good to read the review of other products. And these body care products look great. I am happy you enjoyed this review. I have a friend who would really love all of these body care products. Anything with Cactus I think she would love really. I will have to show this to her. The products sound very nice. I really like the Body Yoghurt. I will be trying that for sure. I haven't heard of this brand but they sure have nice goodies. I will be checking them out esp. their body scrub. That's nice that its 100% vegan. I've bought gifts for friends over the years at Lush Cosmetics. I love body shop products and this new range sounds wonderful.